SANTA CLARA, Calif.--(BUSINESS WIRE)--INTERNET OF THINGS WORLD -- Avnet (NYSE: AVT), a leading global technology distributor, will showcase how the Internet of Things (IoT) impacts daily life in its “Smart Neighborhood” at Internet of Things World, May 16-18 at the Santa Clara Convention Center. In Booth #302, Avnet will demonstrate smart home and smart city technology featuring its customers’ products and Avnet-designed development kits. Avnet’s Smart Neighborhood at IoT World underscores how the company helps its customers bring IoT innovations to market at every stage of the technology product lifecycle. Owlet: Owlet developed a baby sock that tracks heart rate and oxygen levels in infants, designed to notify parents if levels fall outside preset zones. Avnet helped guide their product to market. Rubicon Global: Rubicon Global developed an asset-light, technology-enabled platform that connects customers with an independent network of haulers to change the future of waste. The platform reduces waste and recycling costs for customers, while promoting sustainable solutions for businesses and the planet. Avnet helped Rubicon Global through the product lifecycle. Twyst: With Avnet’s support, Twyst designed the “Smart Bag,” which eliminates the need to wait in checkout lines. Using sensors, this smart retail bag links the in-store shopping experience with the convenience of online shopping. Ubicquia: Avnet has worked with Ubicquia to make cities smarter by embedding streetlight sensors that detect threats such as gas leaks, radiation and gunshots, and alerts response teams. These same sensors alert rural African communities to the approach of dangerous animals. Amazon Alexa Home-Automation: Leveraging the Avnet BCM4343W IoT Starter Kit and Avnet BCM4343W IoT SoC Module, the Wi-Fi Connected (AWS IoT) Amazon Alexa Home-Automation uses a voice-based user interface together with multiple output display options for home automation. Attendees will be able to use voice-activated instructions to monitor conditions inside the home, trigger events, and turn household appliances on and off. LTE Connected Home Security Camera: Avnet will demonstrate a security system camera which transmits its data over the LTE network rather than relying upon home Wi-Fi. Combined with the flexibility of the Raspberry Pi development platform, the AT&T LTE IoT Add-on Kit from Avnet places security and wireless capability within reach of any system designer. Cloud Sense Home Automation: This platform uses the Raspberry Pi Sense HAT and the AT&T LTE IoT Add-on Kit from Avnet for secure wireless access to the cloud. A series of bright multi-color LED indicators are used to reflect the status of the temperature, pressure and humidity in the home, enabling prototyping for Smart Home applications such as HVAC, micro-agriculture, lawn irrigation, weather monitoring and residential construction. LTE Connected Sense Platform for Micro-Agriculture: The LTE Connected Sense Platform for Micro-Agriculture demonstrates how low-cost connected platforms can enable location tracking and remote health monitoring of bee hives that we depend upon to help grow our food supply. The Avnet Global LTE IoT Starter Kit provides a sensing platform that also connects to the cloud via LTE, enabling the design of IoT edge devices that can operate in over 200 countries around the world. Visible Things™: Avnet’s Visible Things™ is an edge to enterprise IoT platform that connects smart devices with various sensor technologies into a central dashboard, providing access to leading technologies through a simplified user interface. Avnet’s dashboard makes sensor and controls data relevant by helping users interact with electronic hardware, learn about the electronic components used in the design and connect with Avnet’s engineers for design assistance. Today, Avnet also announced its latest Visible Things™ Industrial IoT Starter Kit, a complete development solution that enables engineers to get their IoT systems and applications quickly designed, tested and deployed. As the title sponsor of this year’s IoT World event, Avnet’s presence underscores the company’s continued commitment to support customers as they deliver their IoT innovations to the world. Avnet’s “Smart Neighborhood” is located at Booth #302 and will be open on Tuesday, May 16 from 4:00 to 6:00 p.m. PDT; on Wednesday, May 17 from 10 a.m. to 6:00 p.m. PDT; and on Thursday, May 18 from 10:00 to 4:00 p.m. PDT. 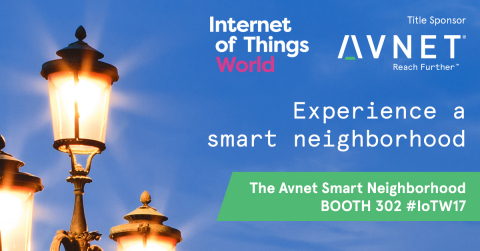 At IoT World, Avnet's Smart Neighborhood (Booth #302) will demonstrate smart home and smart city technology featuring its customers’ products and Avnet-designed development kits.